As a nuclear deal between Iran and the world powers draws nearer, despite hitting some snags, Arab Sunni countries and particularly Saudi Arabia, look more and more anxious to see rival Teheran emboldened with its covert nuke program. They are convinced that any deal allowing Iran to carry on nuclear research will harden Teheran’s positions and boost their influence in the region. In Washington, the Republican-dominated congress also opposes any deal which will not stop Iran from gaining the capacity to develop a nuclear bomb. Several analysts believe that if Teheran gets a deal, the oil-rich Gulf Arab monarchies will also go nuclear to defend their strategic interests and standing in the region. The Saudis are worried about the US-Iranian rapprochement will affect their influence in the region. The United Arab Emirates, which has a long-running dispute with Iran over three Gulf islands, is also anxious, saying a nuclear agreement will give Iran more leverage in the Middle-East and particularly in Iraq, Syria, Lebanon and Yemen wherein the powerful Shia factions are threatening Sunni governments. 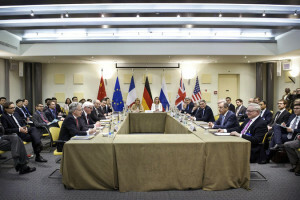 However, the week-long talks currently held in the Swiss town of Lausanne between Iran, the United States, Britain, France, Germany, Russia and China seemed to have reached again an impasse due to major significant differences between Iranian foreign minister and his peers from the six world powers. According to press reports, three key issues stand in the way of an agreement that would end a 12-year standoff between Iran and the West over Tehran’s nuclear ambitions and reduce the risk of another Middle East war. Iran wants all sanctions to be lifted immediately after the deal is signed, while West prefers a gradual process. Teheran is believed ready to limits its uranium enrichment program – and associated research into advanced centrifuges – for a maximum of ten years, but Washington and its Western allies insist on a longer period of restrictions. Iran and the six powers have twice extended their deadline for a long-term agreement, after reaching an interim accord in November 2013. All Middle-Eastern countries are holding their breath and waiting for the outcome of the Lausanne talks. They are anxiously wondering whether the negotiators will reach a final nuclear deal with Iran or extend again the interim accord? Written by: Peter Mulvany on March 31, 2015. Posted by Peter Mulvany on Mar 31 2015. Filed under Headlines, World News. You can follow any responses to this entry through the RSS 2.0. Both comments and pings are currently closed.